One of the world’s most invasive plants, Japanese knotweed was introduced to New England from Asia as an ornamental plant. Knotweed spreads easily and quickly, and provides perfect habitat for ticks. Knotweed forms dense monocultures, with a thick layer of accumulated leaf and fibrous stem litter. A number of mechanisms contribute to its ability to exclude native species; light limitation, alteration in nutrient cycling and allelopathy—the ability to suppress growth of a potential plant competitor by releasing toxic or inhibiting chemicals. Knotweed can contribute both to stream bank erosion and to flooding, when its large, fibrous stems wash into the water during periods of peak flow. Its rhizomes and shoots can penetrate asphalt and cracks in concrete. It is most aggressive on sites with natural or human disturbance; stream and riverbanks, roadsides and construction sites. Knotweed is difficult to remove permanently, but with some perseverance, you can make progress. Herbicides are potentially harmful to pets, children and wildlife – and easily find their way into waterways – so be sure to consult with an expert if you choose to use them. Chemical-free solutions include digging out the roots and rhizomes from the ground (if the patch is small), or for larger infestations, a long-term “cut and cover” strategy is best. 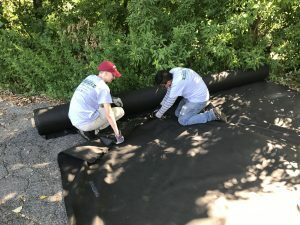 Cut patches of knotweed down to the ground and cover with an opaque blanket that keeps out sunlight and water. These blankets are available from many landscaping supply stores. Once blanketed, you can plant a raised garden bed on top, or cover with stone to improve the appearance. Below: Still River Connections students are removing a massive infestation of knotweed from the Greenway. 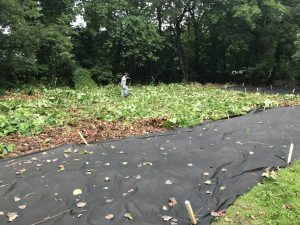 Large patches are mowed short, then covered with a blanket that keeps sunlight and water out for up to five years, ultimately killing the plants. It’s a long and labor intensive process, but it keeps dangerous herbicides out of the nearby river. More than 8,000 square feet have been removed to date.